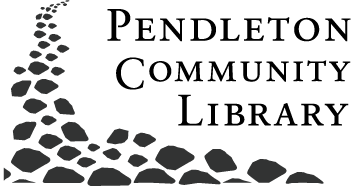 The Pendleton Community Public Library offers public usage of its community room. This room provides seating for up to 100 people or can be divided into two separate rooms, each capable of seating about 50. Use the online form below to submit your request. Please note that requests are not finalized until a staff member has made contact to confirm the reservation. The room is equipped with a kitchenette to handle light refreshments. A dry erase board, DVD player, screen, LCD projector, and laptop are available for use, with advance notice. Internet connections and wi-fi are also provided. There is ample parking to the east of the library, and there is a dedicated entrance for the community room. Chairs and tables will be available in each meeting room. Groups will be responsible for setting up the room in the way they desire, as well as restoring the room to the condition in which it was found. Library staff is not responsible for re-arranging the meeting room. Groups or individuals wishing to use the room must fill out an agreement form. Once a form has been submitted, a library staff member will make contact to confirm the reservation. Reservations are not confirmed until a staff member has made contact with the group or individual requesting the room. Signed forms should be turned in to the library at least one day prior to the requested reservation date. Please be aware that the community room is regularly booked, particularly during evening and weekend hours. Completed forms can be sent to Ashley. There are some restrictions for use of the community room. To determine if your group is eligible to use the room, please review the Community Room Policy.